VANCOUVER — An award-winning, Vancouver-based, singer-songwriter will perform at Bethlehem Lutheran at 7 p.m. Friday as part of the church’s 2010 Winter Olympic Celebrations. Laurell Hubbick has released three albums and performed hundreds of concerts across Canada and the United States. In 2001, the popular TV series, Canadian Idol, named Hubbick Vancouver Idol. In an email, Eunice Famme, a church spokesperson, said the concert is all part of an effort to reach out to the community. Bethlehem is also offering several other Olympic-related events. Between 5 p.m. and 10 p.m. February 16 and February 28, the church is inviting residents and visitors to watch Olympic events on a giant TV screen. 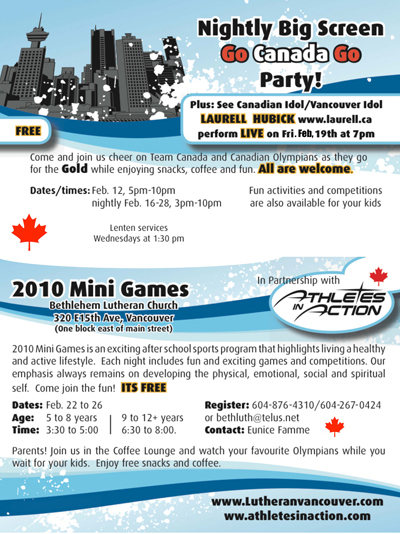 Between February 22 and February 26, the church is offering a program called the 2010 Mini Games. The event promotes a healthy and active lifestyle, and is meant to develop the physical, emotional, social and spiritual self. The free program runs from 3:30 p.m. to 5 p.m. for children aged five to eight. For children aged nine to 12-plus, the program runs from 6:30 p.m. to 8 p.m.
Lenten services are Wednesdays at 1:30 p.m.
Bethlehem Lutheran is located at 320 E15th Ave, Vancouver. To read more about Hubbick, visit http://www.laurell.ca/. I am glad that Tiger Woods is back playing. It makes the sport exciting again.